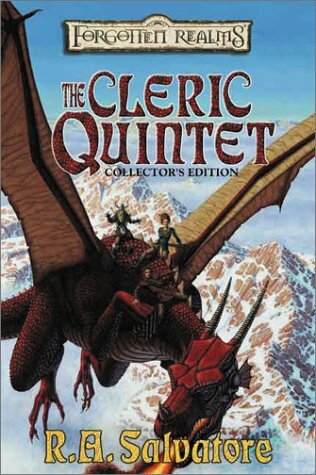 The Cleric Quintet is a forgotten Realms series written by R.A. Salvatore. There are five books in the series. Canticle, In Sylvan Shadows, Night Masks, The Fallen fortress, and The Chaos Curse. You can get all five books in one large hardcover Collector's Edition which you see above for a much cheaper price. The series is about two main characters named Cadderly and Danica and how they must stop the evil in the world. (you may remember them from a couple Drizzt books) The series is definitely worth reading although not at the calibur of excellence as The Demon Wars or Drizzt Books.